Falkirk boss Peter Houston is pleased to be within touching distance of the play-offs after a patchy start to the Championship season. The Bairns are fifth in the table, just three points behind third-placed Hibernian, who they visit on Saturday. "I don't consider getting to the play-offs as a huge success," said Houston, who has beaten Hibs twice this term. "I consider getting promotion a huge success but for us to do it this year would be very very tough." With Hearts running away with the league, Houston reckons there is already only one route remaining to the top flight, via the play-offs. "Hearts are the best team we have played, closely followed by Hibs and Rangers," explained Houston, who was the Championship manager of the month for December. "Robbie Neilson has done a fantastic job at Hearts. He has some good players with a pool strong in depth. "The engine room is Prince Buaben and Morgaro Gomis, two players I would have loved to have brought here but could not touch their salaries. That allied with some of the young players like Callum Paterson and Jamie Walker tells you how strong they are. "Queen of the South have had an exceptional season. We are just delighted to be within three points of them and Hibs after what we feel has been an indifferent start to the season." Hearts remain unbeaten in the league after 19 matches but Houston expects the leaders to slip up at some stage. "One time it will happen and probably it will be something off the shoulders off Robbie," the former Tynecastle assistant manager added. "If they did do that and go unbeaten I would be surprised to be honest. The more it goes on the pressure becomes more on them. Teams will be set out with a view to becoming the first team to beat Hearts. They will just be thinking of how they can get the title in the bag." Houston, who has signed four new players this month, knows his side will need to continue their excellent recent form to make it a hat-trick of wins over Hibs. 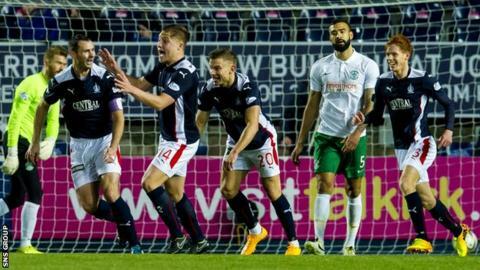 "Hibs are very good going forward and you need to work them defensively," he said. "We've been fortunate to beat them twice because both games could have gone either way. "We have worked hard on making sure we are hard to beat. "We've had five clean sheets in our last seven matches and we make sure we defend from the front."